In the last week, a generous man has put up a tutorial for a 3rd person character controller with inbuilt functionality for Mecanim. I have been following it and now have it working. 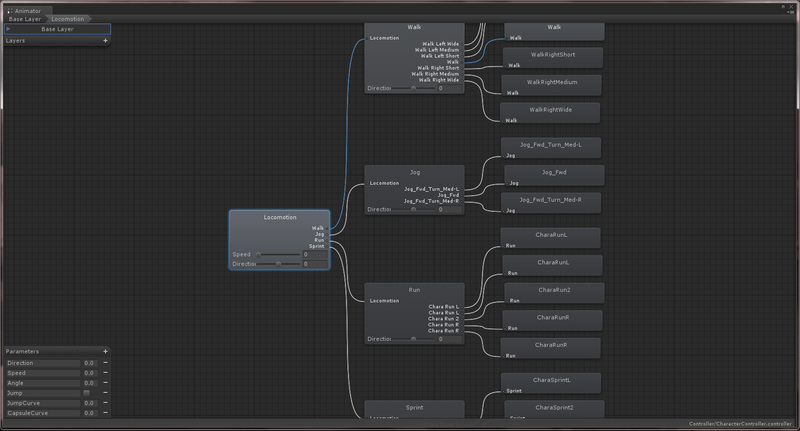 Here you can see the locomotion blend tree which had more animation than I anticipated. However, i will replace the main ones that are more likely to be seen with my own. At the moment they are using the default motion capture clips, which, are still very nice. I have a feeling that Mecanim may be better suited to using mocap data. Here is the overall blend tree. you can see that the characte starts in Idle. When moving, it will go to locomotion, which is where all the animation in the previous image is. When in idle, it can do an idleJump, or when moving, a motion jump. 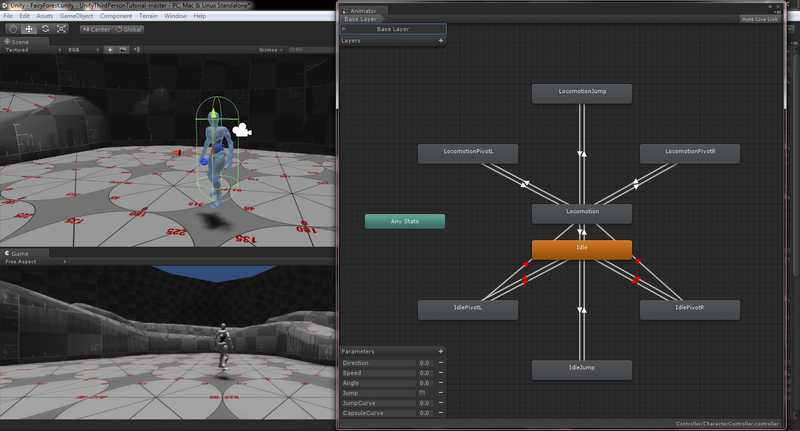 The pivots allow the character to have a turn around and change direction animation. The idol pivots, I decided to ignore and mute them as they didnt really add anything to the character’s motion. I can assume that they are supposed to turn the character around while in idle but they do so by about 10 degrees. The next step is top change the default mesh to my character, add in my animation then build a scene. Character in scene, with animation.